I have two puppies, which means I live in a fur factory. 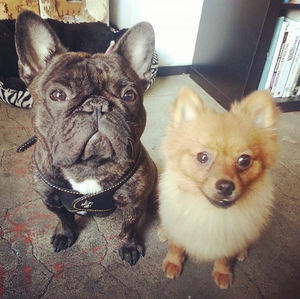 One is a dark brindle French bulldog, who sheds short, coarse hairs relatively infrequently; the other is a sable Pomeranian who sheds long, thin hairs constantly. Everywhere. On everything. Needless to say, I’m definitely at a point in my life where a robotic vacuum that’s specifically designed to pick up pet hair is basically a dream come true. 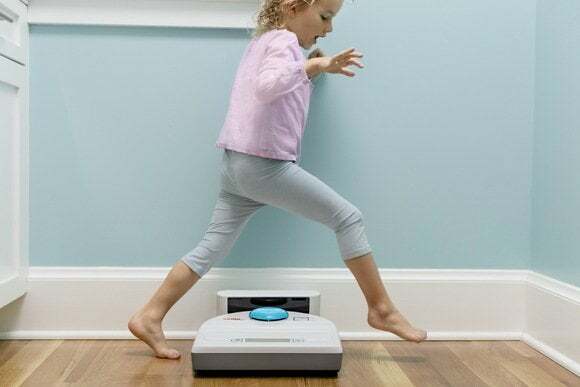 Enter the Neato Botvac 80, a large, plastic, semicircle-shaped robot vacuum that Neato describes as its “best for picking up pet hair." Bingo. The Botvac 80 features a special 10.9-inch combo brush—that is, a brush that combines traditional bristles with flexible plastic blades—that can quickly sweep up dust, dander, crumbs, and of course, Pomeranian hair. The Botvac 80 measures 12.7 inches long by 13.2 inches wide by 3.9 inches thick, and weighs about 9 pounds on its own. It also comes with several accessories, including two extra filters, magnetic strips that you can place around your house to keep the robot from trespassing into unwanted territory, a docking/charging station, and an extra “all-blade” brush that’s convenient for houses whose occupants have long hair, since the all-blade style means there are no bristles for longer hairs to get wound around. Neato instructs you to set up the docking station in an area with at least 1 meter of clearance on three sides (it can sit flush against a wall), so the robot is able to find it easily when it needs to go back and charge. The charging station can stay next to a wall. This is Neato’s second-priciest vacuum, one model behind the Botvac 85, which costs $50 more and features three high-performance filters instead of just one. The 80 looks like the other vacuums in Neato’s lineup: It has a shiny plastic white top, a matte gray plastic bottom, and a circular “Botvision” protrusion on its surface. The protrusion is actually the vacuum’s infrared laser center—yes, the robot uses friggin’ lasers to map out its environment before and during cleaning so it can better avoid obstacles. The 80 features Neato’s signature semicircle shape (the vacuum’s brush sits along the flat edge), which means it’s better at reaching into corners and moving around furniture with sharp angles than round vacuums like iRobot’s Roomba. On top of the vacuum you’ll find the Botvac 80’s control center: a small LCD screen surrounded by four touch-sensitive buttons, two physical buttons, and the door to the vacuum’s dirt bin. 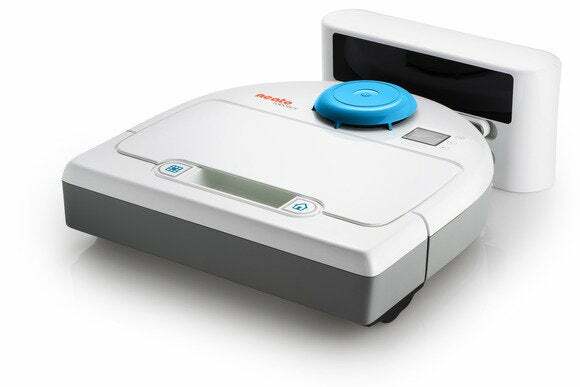 Once you turn on the Botvac, you can use the up, down, back, and select buttons next to the LCD screen to set the robot’s cleaning schedule, and turn alerts (such as a low battery alert) on and off. For each day of the week, you can set a time—right down to the minute—when you’d like the Botvac 80 to start cleaning your entire house. At 3.9 inches thick, it was slim enough to gt under my couch. If you don’t have a schedule in mind, you can ask the Botvac 80 to clean the entire house immediately by pressing the button with the house on it, or you can press the Spot Clean button, which has a picture of a grid on it. That directs the Botvac 80 to spot-clean a small 4-by–6 foot area immediately—handy if you happen to have a mess that you need cleaned up. The Botvac 80 is designed to clean a variety of surfaces, including hardwoord flooring, tile, linoleum, carpet, and in my case, even polished concrete and sheepskin area rugs. The robot rolls around on two heavy-duty rubberized wheels, so it can easily move from one surface to another, even if the surfaces have different heights. Still, if you happen to have particularly high-pile carpets or if you have anything shaggy (such as shag or…sheepskin), the rubberized wheels may get caught on the extra fibers. 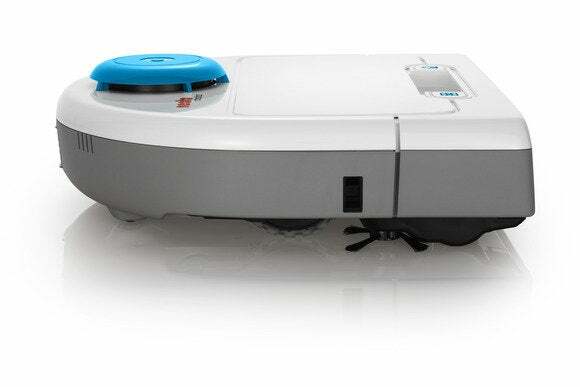 Like other robot vacuums, the Botvac 80 is relatively set-and-forget. Once you give it a cleaning schedule, the vacuum will take care of the rest, methodically cleaning your house until it runs out of juice, and then returning to its base station to recharge. I found that the vacuum takes about three hours to fully recharge, after the initial charge of 12 hours. If the Botvac 80 can handle these two fuzzballs, it can probably clean your house. Thanks to its flat edge, the Botvac 80 does an excellent job of working its way into corners and around sharp edges and angles. The main brush is just a centimeter from the edge of the vacuum, so the 80 does a good job of getting right up against walls, but there’s also a twirly side brush that sticks out to reach every nook and cranny. The side brush spins debris into the path of the main brush, but I found that this strategy didn’t always work, because the Botvac occasionally turned too sharply and missed the spun debris. The Botvac 80 is very good at avoiding both stationary and moving objects. When it first begins cleaning, it uses its Botvision lasers to inventory its environment (this usually takes a few seconds) before it starts moving around. However, it continues to monitor its environment in order to avoid moving objects, such as people and pets, as it cleans. In my time with the Botvac 80, it didn’t hit my feet once, nor did it run into my dogs. Of course, my dogs spent approximately 100 percent of the time running away from it, so that wasn’t exactly a huge feat. If the Botvac gets caught (for example, during one of my tests I threw a cardboard box on top of it), it can use its wheels, which are on springs, to sort of hop up and down and try to extricate itself from the situation. The lasers let Botvac 80 avoid objects that are still or moving. If you’re looking for a robot vacuum that’s easy to use and that will pick up tons and tons of pet hair, you’re looking for the Neato Botvac 80. Its large combo bristle-and-blade brush, unique semicircle shape, and larger-than-average dirt bin make it particularly effective at picking up pet hair and dander along with other debris. 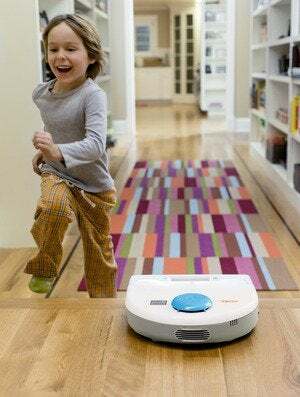 It’s also quieter than most vacuums, good at maneuvering around obstacles, and you can easily keep it from going into unwanted areas with magnetic strips—unlike the Roomba, which requires you to set up a “virtual wall” with battery-powered infrared sensors. But the Botvac 80 does have its downsides. For one thing, while it has an intuitive touch interface located on the robot’s face, it doesn’t have a remote control for extra-lazy people such as myself. The vacuum’s dirt bin, while large, is not that large (I found myself having to empty it at least once a day—or maybe my dogs just shed that much), and the filter gets dirty very quickly. Ironically, the easiest way to clean the filter is to use a handheld vacuum, which means you still have to be a multi-vacuum household. It’s OK. My pups are worth it. It's quiet, it gets into more corners/angles, it's good at avoiding obstacles, and it picks up more pet hair than I even knew was on the floor.